Native bees have piqued my interest this year. There are so many varieties sharing the flowers with our honey bees. We had Sam Droege of the U.S. Geological Survey speak at a recent club meeting, and he advocated the benefits of bee watching as an alternative to butterfly or bird watching. There are more bee species than butterflies and birds combined, and bees are much more stationary than most birds. Perhaps this will become a pastime. So I have been studying the biological taxonomic hierarchy of bees lately. It is all rather confusing, so this write-up will perhaps clarify this for myself as well as a couple readers. I gathered much of the material here from Wikipedia, and also verified some information with other sources. You may complain that Wikipedia is not the best original source if you wish. My honey bees (a hybrid of Apis mellifera carnica) at the entrance to my hive Saturn on October 28, 2017. Some readers may be familiar with a version of the mnemonic Dear King Philip Come Over For Good Soup to remember the major ranks in biological taxonomy. The first letter of each word represents the corresponding term shown in the graphic. D for Dominion, K for Kingdom, and so forth. Each rank represents a classification level, from large groups like plants and animals down to specific species such as Canis familiaris (dogs) or Apis melifera (European honey bees). Biologists typically use three Domains for life on earth. Two for the tiny prokaryotes, Archaea and Bacteria; and another for life with membrane-bound nuclei, Eukaryota. The eukaryotes include animals, of course. Kingdom Animalia contains humans, dogs, horses, centipedes, and bees. In addition to the ranks shown in the graphic, various subranks have been created by biologists through the years to further divide species with similar characteristics into related biological groupings. We will see many of these as part of the discussion. The advent of DNA sequencing and other advances has led to changes in biological taxa over the past few decades. DNA provides insight into the evolutionary origins of different animals, and the relatively recent term Clade is used to represent the evolutionary origins of a species. As I mentioned at the start, it is rather consuing. We will not discuss clades here, other than this brief mention, as I haven’t really wrapped my head around them yet. Let’s begin at the top with all animals. Other kingdoms include plants (Kingdom Plantae) and fungi (Kingdom Fungi). This diagram contrasts the initial hierarchy for humans and bees. Mammals, of course, are in the Class Mammalia of the Subphylum Vertabrata (vertabrates) in the Phylum Chordata. Bees are classified in the Order Hymenoptera within the Class Insecta (insects). Hymenoptera is a large order of insects, characterized by the female having a special ovipositor for inserting eggs into otherwise inaccessible places, like a honey bee cell. The ovipositor may be modified into a stinger as well, like in a honey bee worker. Hymenoptera includes ants, sawflies, wasps, and bees. In contrast, the dreaded Varroa destructor is part of the Subphylum Chelicerata shown in the diagram. I won’t go through the details of varroa, though for reference varroa are a type of arachnid (Class Arachnida) in an order that includes ticks and mites (Order Parasitiformes). 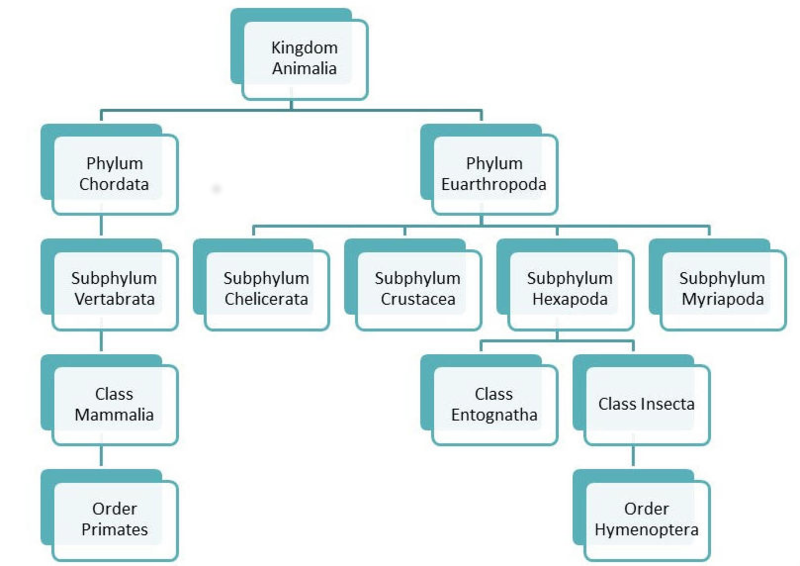 Hymenoptera is divided into the two suborders, with Suborder Apocrita representing ants, bees, and wasps. Jumping from the Order rank straight to a Family often involves a huge number of species with dozens of families. So biologists have created additional ranks like Suborder, Infraorder, and Superfamily to provide additional groupings and confuse the poor layman. Here we see an example of this, going from Order to Suborder to Infraorder to Superfamily. 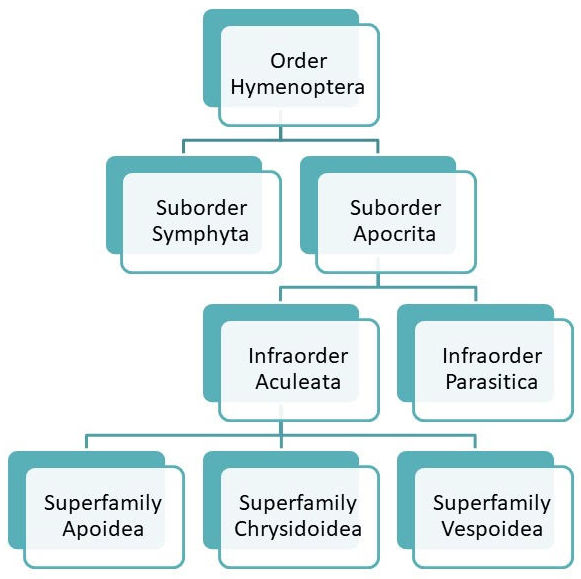 Hymenoptera contains two suborders, and Suborder Apocrita contains two infraorders. Infraorder Aculeata has the defining feature of modifying the ovipositor into a stinger. The venomous stings in this infraorder may have aided the evolution of social behavior, since a colony with some insects specializing in a stinging defense (workers) might enable better survival over similar insects living the solitary life. We need only one more grouping before we can reach the family containing bees. The Superfamily Apoidea is broken into three subgroups: one for some wasps (Spheciformes), one for bees (Anthophila), and one that is extinct (Incertae sedis). The oldest known species of bee, Melittosphex burmensis, falls into the extinct subgroup. A 100 million year old Melittosphex bee fossilized in amber was found in 2006. Family Andrenidae are commonly called mining bees, and represents over 1300 species. Family Apidae is the largest family with over 5700 species. This includes carpenter bees, digger bees, cuckoo bees, bumble bees, orchid bees, stingless bees, and honey bees. Family Colletidae represents over 2000 solitary bees, commonly referred to as plasterer bees or polyester bees. This family includes the yellow-faced bees native to Hawaii as well. Family Halictidae is second largest family of bees, commonly referred to as sweat bees. These mostly tiny bees are often dark-colored or metallic in appearance. Family Megachilidae is commonly called leaf-cutting bees, with over 4000 species worldwide. Family Melittidae represents a type of bee found in Africa and contains about 200 species. Family Stenotritidae is the smallest of the bee families, with roughly 21 species of bees found in Australia. A wide range of bees fall into the Apidae family. This family is divided into three subfamilies, and from there into numerous tribes. The taxonomic term Tribe is new to me as part of this research, and simply provides a way to further divide subfamilies into common groupings. A Subtribe rank is sometimes used as well. There are two subfamilies not expanded in the diagram. Bees in the Subfamily Nomadinae are commonly called cuckoo bees, and occur across 31 genera in 10 tribes. Bees in the Subfamily Xylocopinae are mostly solitary bees, and include the carpenter bees. 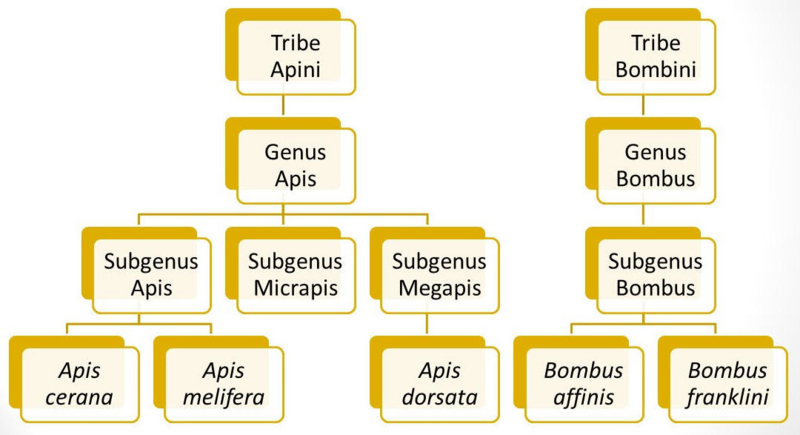 Subfamily Apinae is divided into 15 different tribes, including the Apini tribe for honey bees. Five tribes representing the more well known bee species and are shown in the diagram. Tribe Anthophorini are the digger bees. We have finally reached the honey bee. The following diagram shows the single living genus and recognized subgenus for the honey bee and bumblebee tribes, as well as a few of the species in each group. The scientific name for a species consists of the genus name plus the species name, and is usually written in italics. Apis cerana, the eastern honey bee or Asian honey bee, is the original host of Varroa destructor. The closely related Apis mellifera is the western or European honey bee. There are seven recognized species in the Apis genus. The various races of our Apis mellifera are referred to as subspecies. This includes the Italian honey bee (Apis mellifera ligustica), the Carniolan honey bee (Apis mellifera carnica), and the African honey bee (Apis mellifera scutellata). For bumblebees, there are seventeen subgenus shown on Wikipedia. These contain over 250 species of bumblebees, with many of them found in North America. The two shown in the diagram are the endangered Rusty-patched bumblebee (Bombus affinis) and the extremely rare or possibly extinct Franklin’s bumblebee (Bombus franklini). Putting these together, here is the full taxonomic hierarchy the our western honey bee. This phrase for this post comes from Charles Darwin’s famous book On the Origin of Species. Darwin summarizes his revolutionary work in the final paragraph of the book. Darwin is quite eloquent with his words, though as you can see here he can go on a bit. I have tried to read a paper copy of his book more than once, and must admit I get bogged down in the flowy Victorian text. I have enjoyed listening to the book on audiobook, though, while driving back and forth from work over a few weeks. It is a fascinating listen, with an entire chapter on bees, and worth the time if you have the interest. Readers more patient than me may even be able to read the book. While constructing this post I was looking for a quote that mentions “family tree” or something about relatives or family relations. I almost titled this post “The bee doesn’t fall far from the tree.” Then I found this excerpt on Goodreads while looking for quotes on evolution. It seemed a perfect fit for the topic at hand. Thanks for the detailed explanations. Still a great deal to remember (too much for me) but at least I see the structure and rationale. Yes, it’s both wonderful and beautiful. Thanks, sassafras. That’s about where I am as well. Good to lay it all out and see how it fits together. Bee nice to see if I could take some pictures next year and associated pictures with the various bee families. We’ll see what the future brings. Many thanks for the article, very very interesting! Yesterday I was reading again this article and I’ve been inspired to learn a little bit more about the classification of the honeybee. Right now I’m digging on english and italian wikipedia pages, gathering some pictures and writing an article in italian language about this. I find that your schemes are very clear and explanatory and I would like to take a cue from those to write the article (redesigning them obviously). Please let me know if it’s ok for you and have a nice day! Luca, yes of course. Please feel free to use the article and images, along with a reference to this site where you found them. Please let me know when it is available, as I would love to see what you come up with. Enjoy. Many thanks Erik, I’ll keep you posted and obviously I will put a reference to your article. See you soon!